Techathon 2018 – A fun filled event! The Techathon lets young people aged 8 to 18 explore the possibilities of technology in an informal and creative environment. Over the course of two days, each team takes on one of our challenges, trying out ideas, finding out what works and what doesn’t. It’s a great opportunity to meet like-minded people, expert mentors and even potential future employers. It’s a fun-packed event with the opportunity to learn new skills, make friends and even win prizes. Find out more in our FAQs. Tickets for the two day event cost a maximum of £10, and include lunch, snacks and refreshments on both days. A two day event where young people have fun exploring tech and taking on tech challenges. Who is the Techathon for? Young people aged 8-18 who are not yet at university and are interested in tech. Does my child need to know how to program or have any technology experience? No, the Techathon is for anyone, from complete beginners to tech wizards. The challenges are designed to let everyone take part and approach them in their own way – whether that’s thinking about ways to tackle a problem, designing a possible solution, building something in Scratch or taking on some advanced coding. There will be friendly, professional mentors on hand to help. What will my child get out of attending the Techathon? They can find out about different technologies, and learn from each other and from mentors who are already working in the tech industry. It’s not just about programming / coding – there’s the opportunity to develop other skills like understanding how to approach a challenge and work in a team. It’s also a chance to make friends and have fun. Does my child need to be part of a team? Participants can tackle challenges on their own or as part of a team of up to four people. You can come with your friends as a ready-made team, or we can help put you into a team with other young people. Please let us know if you need help teaming up, contact us. Do parents / guardians need to be there? If your child is 12 or under, you must accompany them to the Techathon. Participants aged 13 or over can attend on their own, provided we have details of an emergency contact. Parents and guardians are strongly encouraged to attend the initial introductory session and the final show-and-tell / prize-giving! How much will attending the Techathon cost? A two day ticket costs £10, which includes lunch / snacks / refreshments for the young person. If cost is a problem for you, please contact us – we can provide a free ticket thanks to the support of our sponsors. 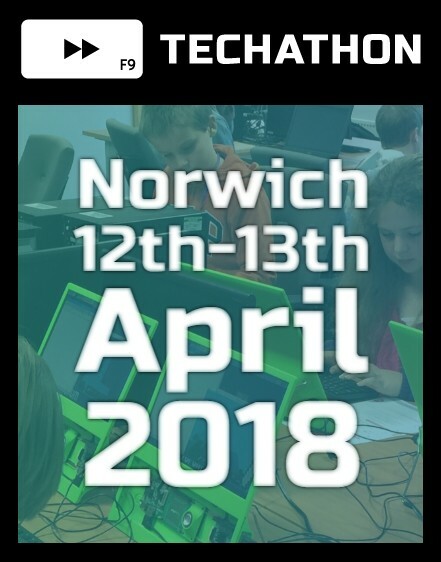 Tickets are free for members of the Norwich Young Makers Tech Club. You can get tickets online.